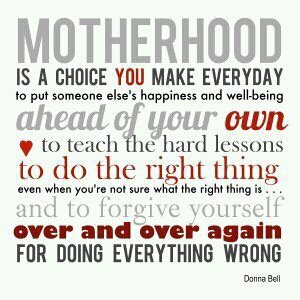 Motherhood is a choice you make everyday to put some else’s happiness and well-being ahead of your own, to teach the hard lessons, to do the right thing (even when you’re not sure what the right thing is…), and to forgive yourself over and over again for doing everything wrong. This is an interesting quote to me because there are things I love and things I am not so sure about. 1. IF you are not doing it at the detriment of yourself. Think of the idea of being in a plane that is going down and that you sometimes need to help yourself before you can help others. So, if you commonly find you are ignoring your real needs in order to care for the needs of your children, take a step back and try to figure out how to work your needs in there. If you continually ignore your needs, you will burnout at some point and not be available to your children in the future. I think we often have to do this on the short term. Sometimes we are sick and still have to care for our children rather than chill out on the couch all day like we did when we were kids (weren’t those the days? I must say my mom was the best nurse ever when I was sick). Our need to do nothing when we are sick is trumped by our children’s real needs of being fed that day. The Gist of Babywise and Welcoming Baby to the Family http://babywisemom.blogspot.com/2009/03/welcoming-baby-to-family.html). This starts at birth and really just continues on. We teach our babies to sleep. We teach our toddlers to be kind and to share. We let our children learn through consequences. We teach our children how to get along with others. This is something I appreciate so much right now. This is especially true with our oldest children, and it just gets harder as they get older. What are the right answers? Things are more cut and dry with the toddlers, but as they get older, some things are more difficult to know–context comes into play and it is hard to teach your child to do a certain thing, unless X happens, in which case you should do something totally different. And many times we don’t have the answers as parents–especially with our oldest because we are first time parents. And sometimes we don’t know what the right thing is because we are raising a generation in a very different world from the one we grew up in. At what age do you give your child a cell phone? Hey I didn’t have one until college and I survived, but that was in a very different world. Some kids have them at 6 or younger these days (I feel old saying “these days.”). What are the benefits? What are the risks? Once the cell phone is a part of your child’s life, what will be the rules surrounding it? Similarly related, how do we teach these children to have social skills on an interpersonal, face-to-face level when the world seems to be sucking all opportunity away from it? Texting happens between people who are in the same room–technology easily interferes with normal situations when we talked to each other “back in the day” (again, old). Kindergarten classrooms used to be all about teaching social skills–now they don’t have time for that. We don’t have experience to look to and learn from in this new world–we are the pioneers, and we do not have all of the answers and we often don’t know what the right thing is. And of course “the right thing” varies from child to child. Oh yes, this is not new. This is as old as parenting. We all make mistakes. We all have opportunity to wonder how we could have done things differently. Notice the “over and over again” part. You have to learn to let go of the mistakes. Learn from them, but don’t beat yourself up over it. Just the other day, I kept Brinley up too long and she had a hard time falling asleep. I felt really bad about it and started to stress, then I talked to myself (I often put myself in “Chronicles” mode and talk to my normal self–I make more logical sense in Chronicles mode 🙂 ). I told myself to stop and think of what I learned. I learned one hour and thirty minutes was clearly too long for her. I told myself it was a lesson learned and a mistake I wouldn’t repeat. Time to take a deep breath, internalize the lesson, and move forward. I would love to hear your thoughts on any one part or all parts of this quote! Want to join the fun? Share your thoughts on the quote either here in the comments or on your own blog and link up in the comments. I've seen this going around on Facebook for awhile, but never really read it carefully until recently.What stands out most to me, at this time in my life, is the end. About forgiving yourself. Because I am terrible at that and tend to beat myself up for hours after my little one is in bed. I mentally flog myself over every failure, cursing myself for not being perfect. Which is dumb and never helps at all except to make me feel utterly horrible.So, practicing forgiveness is something new to me and something I am working on. This is so good. I like the last part best. Motherhood is all about putting someone before yourself, but as you pointed out, it's in particular ways – not in every way. You don't disrespect yourself to put them first…except when you do. If it's a child's true need, you do anything. But it is hard for me to know sometimes when is the time to bend over backwards for them and when is the time to have them work it out on their own. That's why I like the mistake part. There is always an opportunity to make a mistake. They feel like huge mistakes, but maybe they are not as huge as they feel.